Keycom Electronic Publishing was founded in April of 1982 as a joint venture of Centel Corp., Honeywell Inc, and Field Enterprises Inc. Centel, the nation's fourth-largest phone company, (which also owned many local cable stations) would own 54%, Honeywell, a computer systems manufacturer, would own 30%, and Field Enterprises, publisher of the Chicago Sun Times, would own 16%. They planned to invest roughly $20 million over the next two years into a teletext system based on the BBC's Ceefax model. 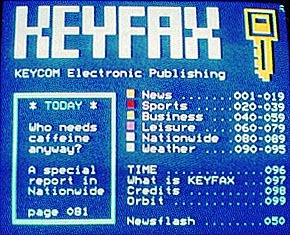 The main component of this teletext system was Keyfax, a 100-page teletext "magazine." Keyfax was broken down in to six basic sections: news, sports, weather, business information, travel data and leisure-time activites. Keyfax was originally carried on the vertical blanking interval of Chicago's WFLD, a Field-owned station, but soon was piggybacked onto Ted Turner's "Superstation" WTBS, giving Keyfax a potential audience of 22 million homes, or 25% of U.S. television homes. Keyfax cost $19.95 per month  $9.95 for the decoder rental and $9.95 for the service itself. Cable carriers received 25% of this fee for carrying the signal. Keycom's marketing goal was to reach 1% subscriber penetration for Keyfax within 30 months of startup. Measuring from the projected startup date of November, 1982, this meant at least 200,000 subscribers by early 1985. Keyfax began service as projected in November of 1982, with one minor hitch  no one could view it. The decoders used to extract Keyfax data from the VBI were British-made (Keyfax was based on the Ceefax model, remember?) and thus had to be approved by Underwriters Laboratories before they could be distributed in the U.S. This proved to be a lengthy process, and it would be nearly 1984 before the units were available for widespread distribution. This was a major setback for Keycom, especially in light of the large publicity campaign it had launched to promote Keyfax. By early 1984, Keyfax had only 30,000 subscribers  far behind pace to reach 200,000 by 1985. Then another cloud developed on the horizon. In January 1984, Rupert Murdoch's News America Publishing acquired Field Enterprises and the Chicago Sun Times. Shortly thereafter, Murdoch gave a speech before the New York Chapter of the Public Relations Society of America, saying, "I do not believe that tomorrow's newspaper will be delivered on a TV screen." Within six months, Murdoch sold News America's 16% share in Keycom back to Centel. By June of 1984, Keyfax had been cut to only 50 pages, and 40 staffers had been laid off. Centel alone was $15 million into the project by this time, and Keyfax's time was up. By November, Keyfax had been dropped from the VBI of Turner's Superstation, and the teletext system was finished. But Keycom was not. Its failures in the teletext market notwithstanding, Centel was prepared to take a risk on a videotex system as well. 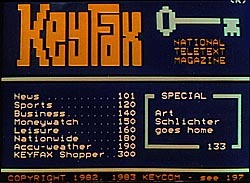 Almost simultaneous with the death of the teletext version of Keyfax, Keycom launched Keyfax Interactive Information Service  a Chicago-area videotex system aimed at the 500,000 personal computer users in the Chicago market. The new system lauched with 200 initial subscribers who accessed the system via a personal computer outfitted with Keycom's $59.95 software package, or through a Honeywell proprietary terminal. The service ran $14.95 a month for 5 hours use, or $29.95 a month for 15 hours use. Within three months, Keyfax was again struggling. Rumors swirled that Honeywell was on the brink of abandoning its share in Keycom, that Keyfax would be cut back to ASCII-only, and that a six-month deadline had been set to turn around the flagging service. By late February of 1985, Keyfax was believed to have only 300 subscribers. Keycom cut back its $3 million promotional budget by 70% and laid off another 28 staffers. In March of 1985, Keyfax added several features hoping to boost the product's popularity. Of note were "Captiol Q and A," an interactive feature which linked subscribers with a State News Service reporter who would answer questions about state and federal politics, and "Market Data," a commodities quotes and news service. But these did little to spur subscriptions, and in May Honeywell sold its interest in Keycom to Centel, leaving Centel the sole owner of, and investor in, Keycom. In a last-ditch effort to turn Keyfax around, Keycom "refocused" its service from the consumer market to the business market, laying off another 60 employees in the process. Keycom executive vice president James P. Dolan noted that "Videotex has the stink of death about it," adding that he preferred to refer to Keycom's product as an "on-line business information system." But it was clear that Keyfax wasn't going to take off. In May of 1986, Centel conceded that Keyfax was "not going to become an economically viable proposition in the foreseeable future," and ceased all residential electronic information services. By June, Keycom Electronic Publishing had been completely absorbed into Centel, ending its status as an independent business entity. In the end, only two employees remained to hold the vestiges of Keycom in the Centel organization, conducting videotex research and development within the Market Planning department.